In 1967, the small German automaker NSU introduced what would be its final and most ambitious product: the remarkable Ro80. It was NSU’s first and last luxury car, a sophisticated, highly aerodynamic sedan powered by a Wankel rotary engine. The Ro80 survived for 10 years, generating critical acclaim and controversy in roughly equal measure. In this installment of Ate Up With Motor, we take a closer look at the turbulent and sometimes troubled history of the 1967-1977 NSU Ro80. 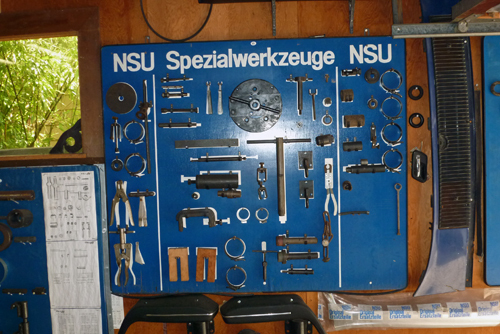 NSU was founded in 1873 in the small town of Neckarsulm at the union of the Neckar and Sulm rivers in the German state of Baden-Württemberg. Like many early automakers, the company started off in a very different field: in this case, sewing and knitting machines. 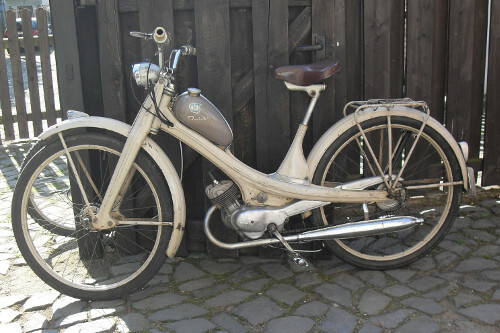 (NSU was originally an acronym for Neckarsulm Strickmachinen Union, Neckarsulm Sewing Machine Co.) NSU started building motorcycles in 1901 and automobiles in 1905, followed a few years later by trucks. Although the company produced some successful and rather sporty cars in the 1920s, the onset of the Depression led NSU to sell its automotive business to Fiat (which used the NSU-Fiat brand into the mid-1930s) and focus exclusively on motorcycles and motorbikes. It was not until the mid-1950s that NSU once again turned its attention to automobiles, introducing the NSU Prinz in 1957. While NSU had offered four- and six-cylinder cars back in the 1920s, the Prinz was a rear-engined mini-car powered by a decidedly motorcycle-like air-cooled, two-cylinder engine. NSU introduced its first four-cylinder postwar car, the Prinz 1000, at the 1964 Frankfurt auto show, but managing director Gerd Stieler von Heydekampf had already set his sights on bigger game. The West German economy had improved markedly in recent years and buyers were graduating from mopeds and tiny bubble cars to larger and more luxurious sedans. NSU’s market share was only modest as it was; if the company didn’t evolve, its future looked gloomy. In late 1962, NSU commenced work on a new model known internally as Typ 80. As originally conceived, it was to be in the same class as the Ford Taunus P4. Design targets were an engine output of 80 PS (79 hp, 59 kW), a weight of 800 kg (1,765 lb), and a price of 8,000 DM — about $2,000 at the contemporary exchange rate. Like the Taunus, the Typ 80 would have monocoque construction and front-wheel-drive, developed by chief engineer Ewald Praxl. The new model’s styling, meanwhile, was the responsibility of in-house designer Claus Luthe, who had joined NSU in 1956 after stints at Fiat and the bus maker Spengler. Luthe’s design, commenced in early 1963 and completed as a full-size model that September, was exceptionally clean and airy, with a large, six-light greenhouse that made the car look smaller than it actually was. Space utilization was excellent, but the Typ 80 was far less boxy than most contemporary German sedans, leading to (unfounded) rumors in later years that it was actually designed in Italy like NSU’s earlier, Bertone-styled Sport Prinz coupe. The Typ 80’s most impressive attributes were its aerodynamics; in the interests of maximizing fuel economy, low drag was an important part of the design brief. Subsequent wind tunnel tests at Stuttgart Polytechnic Institute revealed a drag coefficient of 0.355, outstanding for the era. 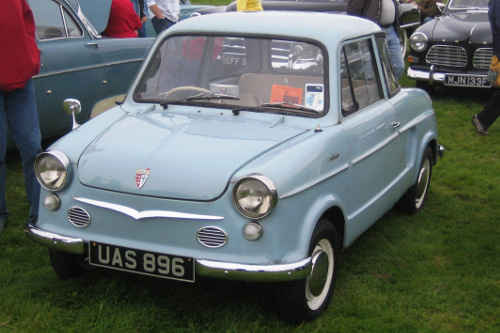 The full-size model, which was presented to NSU’s managing board in May 1964, was very close to the eventual production model in shape, but not dimensions. After considering the car’s likely cost, Von Heydekampf and the board selected a loftier target than the Taunus: the executive car market occupied by the likes of the Mercedes W110 (200/230) and BMW Neue Klasse sedans. To compete in that segment, the Typ 80 would be scaled up in size, weight, and price, eventually rising from 8,000 to more than 14,000 DM (about $3,500). You’ll note that we haven’t yet said a word about the Typ 80’s most significant and unusual feature, its rotary engine. However, even with a completely conventional powertrain, the Typ 80 would have been a very ambitious step for NSU, analogous to Honda proceeding directly from the original 1972 Civic to the six-cylinder Legend. BMW, of course, had developed its Neue Klasse sedans after several years of focusing on motorcycles and mini-cars, but BMW had also built larger, more prestigious cars like the 502, 503, and 507 throughout the fifties and early sixties (albeit not in large numbers). By contrast, NSU hadn’t built anything like a luxury car in more than 30 years. Moving the project so far upmarket would have been a gamble no matter what, but what elevated it from bold marketing move to Citroën-like cliff-diving audacity was the Typ 80’s intended engine, NSU’s greatest and riskiest asset: the brainchild of inventor Felix Wankel. We talked about the development and workings of the Wankel rotary engine in last year’s article on the early Mazda rotaries, but here is a recap for those joining us late. Inventor Felix Wankel conceived the rotary engine while still a teenager and began filing patents on such engine designs in the 1930s, but his work on the rotary was interrupted by other projects and by the war. In 1936, Wankel joined the Deutschen Versuchsanstalt Für Luftfahrt (German Experimental Institute for Aviation), designing rotary valves for Daimler-Benz’s DB601, a 33.4-liter (2,020 cu. in.) V-12 for military aircraft, and later the Junkers KM8 torpedo engine. After the German surrender, Wankel spent time in prison for his military work, but he was released in 1946 and eventually allowed to return to practical research, establishing a new shop in Lindau, Bavaria. Shortly afterward, Wankel’s old acquaintance Wilhelm Keppler arranged an introduction to Victor Frankenberger, NSU’s technical director, and NSU research chief Walter Fröde. On Fröde’s recommendation, NSU signed a consulting agreement with Wankel, first to apply Wankel’s rotary valve concept to motorcycle engines and subsequently to develop a unique rotary supercharger. Throughout his consulting work, Wankel tried repeatedly to convince von Heydekampf and the NSU board to fund the development of a rotary engine. However, NSU was far from over-capitalized, so it took three years and a great deal of cajoling before the board finally agreed. Although NSU began selling patent licenses almost immediately, beginning that fall with a deal with the aviation company Curtiss-Wright, the KKM had a long way to go before it would be a viable production engine. Fuel and oil consumption were inherently high, low-end torque was poor, and early engines suffered a host of serious maladies, including excessive exhaust smoke, seized bearings, heat-induced cracks around the spark plugs, and scored rotor housings (the infamous “chatter marks” that would also plague Toyo Kogyo’s development efforts). Probably the greatest challenge was the apex seals at the rotor tips, which were responsible for maintaining compression and preventing exhaust gases from mixing with the intake charge. Developing workable apex seals would be a major test for every user of the Wankel KKM design, including NSU itself. I believe this is the most comprehensive NSU story ever published in America. The research for the article is top notch. When I moved to Boulder, Colorado, in January 1972, there was an NSU dealership downtown with a Ro 80 in the showroom. I had read some articles about the car and knew what it was, and I don’t know why I didn’t stop in for a closer look at this one. I remember it being burnt orange. I don’t know if it was an incoming ’72 or a leftover ’71. I think the dealership was still there when I left Boulder in August 1973, but I hadn’t really been keeping tabs on it. It’s possible — I wasn’t able to find any definitive answers on how long NSU had U.S. franchises or what happened to those places after NSU pulled out. Did they get Audi franchises? Did they just go away? If anyone has more specific information, I’d be very curious. As I said in the text, it’s hard for me to see NSU sticking around long after MY 1973. By that point, the Prinz and other models were out of production, and I don’t know of any attempts to make any of NSU’s cars (including the Ro 80) compatible with the U.S. bumper standards. Regarding Ro80 interior storage, there’s plenty. There’s a large “magazine” shelf below the 5 band radio and glove box. The front seat backs have two large pockets for those sitting in the rear seats. practically worthless and I have been a Wankel fan ever since. The Ro80 interior was then criticised for it’s “Germanic” plainness but not by me; I have never gone for the leather / wood / wool interiors that Brits. are supposed to like. I loved the space, the quiet, the view through those huge windows, the ride, the fine steering and superb brakes. And of course that fantastically smooth engine! My car had 47000 odd miles when I acquired it, definitely on the original engine. There were some starting issues at first but these were fixed with a change to NGK spark plugs. I think I got about 20 miles from a UK gallon, not good but the engine did encourage full throttle. Sadly it had to go in the end due to rust. 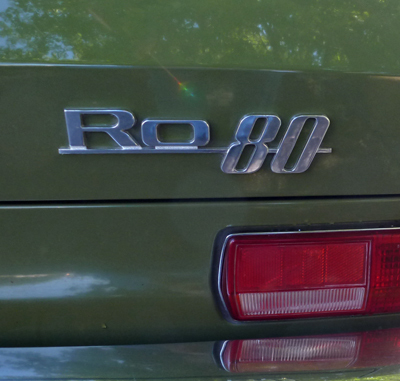 Well, the Ro 80 may not have matched cars like the XJ6 for that British men’s club feel, but from a packaging standpoint it was really no contest. When [i]Car[/i] compared the Ro 80 to the BMW 525 and Jaguar XJ6L Series II in 1974, they made the usual complaints the NSU looking too stark, but they had to admit that Ro 80 was roomier than even the long-wheelbase Jag. I guess the story comes full circle with the Wankel-engined, hybrid concept, the Audi A1 e-tron. Thank you again, do you read my mind? I have reflected upon the Ro80 many times with Mazda ceasing production of a rotary engined auto. I was so enthused by your article that I had to share it at work. I thought that my description of a rotary combustion engine would be perfectly understandable. This was not the case.I did, however, garner some understanding of my interest when I E-Mailed an image of the Ro80. Even a complete non car person offered a comment that it could not be that old.Indeed. I always thought the RO80 was one of the sharpest designs of the ’60’s and wanted one, despite the problems with the early Wankel. Still a stunning looker and a real pioneer! Looks like you fell into the Silicon-Silicone trap! Silicone is a rubbery material familiar to most people as bathtub caulking. It is also what attaches the tiles to the space shuttle. There is no such thing as Silicone Carbide! The above quote should have read “silicon carbide”…. a very hard crystalline substance. But none of the above detracts from the excellent piece on the Ro80! That was a typographical error in the photo caption; I’m well aware of the difference between silicon and silicone, and you’ll note that it was spelled correctly in the first instance in the text. Thanks again Aaron, a lot of stuff I did not know about the RO80, I've only seen one. Just speculating, but on general principles, I wouldn’t think that NSU dealers would automatically be grandfathered in. I’d think that Audi would need to feel the need for another dealership in that area and would need to see the ex-NSU dealer as a worthy candidate for the franchise. You’ll notice that on the license plate frames of Jim’s car, it says Lake City. Lake City is a neighborhood in the northeast corner of the city of Seattle proper, and Lake City Way is a major arterial through the area. I moved to Seattle in 1981, and I have dim memories of seeing a billboard for an NSU dealership on Lake City Way in the early ’80s. It was a couple of miles south of the commercial strip in the heart of Lake City, where the dealership would presumably have. Of course, at this point the billboard didn’t necessarily mean that the dealership was still around. All NSU dealers in America sold other imported cars. Most sold other German cars. The largest was Overseas Imports in Livonia, Mich. Their main line was Italian cars because the owners were Italian. I asked about the why they sold NSU’s and was told they respected the NSU marque and they liked to quick and nimble cars that were easy to work on… he said one can change a clutch in 30 minutes. Which is true. At least in the U.K., the “book” time for a clutch job was listed as 5.3 hours, although that was still not bad for a FWD car and a good deal shorter than a Citroën DS (which was 12 hours) or a Rover 2000/2200 (which was over 10 hours), both engine-out jobs. I think the 30-minute clutch change applied to the rear-engine air-cooled NSUs. Lake City Auto Imports was located at 91st and Lake City Way, which is in Seattle City limits. I bought my Ro80 from one of the owners who was going through a divorce and need to liquidate assets. I paid full market value at the time. After having three kids and having three citations in so many years I decided to retire the car till I wised up. The car set in my shop untouched for over 30 years. I went through the car and changed all fluids, wiped off 30 years of dust with a diaper to prepared it for Seattle’s huge 2010 Greenwood Car show. Out of 900 cars entered the Ro80 came in number 27 of 30 awards. My car won Best of Class. There were so many fine cars in the show I would have been happy to be in the top 100. Being a judge at a car show is a tough job. What an excellent piece of research here. I have an RO80 myself. It was apparently brought over by a US military officer. I have attended the Essen Techno Classica show a few times, and looked for an RO 80 in Germany, but they are hard to find even there, and then of course there is the rust issue. I was stationed in Wiesbaden in 1970-72, and I remember seeing them exit the autobahn, with trails of blue smoke following them as they de-accelerated. I have also found a few Birotors for sale in France – the factory tried to buy every single car back to destroy them, but a few slipped through their fingers. Now that would be a find! Hi ROers, I am sitting on 3 Ros in Stuart Florida. A 1976 in super condition silver. A 1971-2? in good condition orange, great black vynil interior. And a 1969 ceased engine, avacado green. Actually looking to sell the 71 & 69 if anyone is interested. Email me. Rust minimal in the two for sale. I just read your post from Jan, 2013. Do you still have the 2 RO80 for sale ? I am interested in getting one. I am in California. nice write up by Aaron ..
Too bad no company ever put Bentele’s direct injection technology from 1962 into action. I regret that for space reasons I haven’t been able to get into Curtiss-Wright’s Wankel development, either here or in the Mazda article. C-W did a lot of work on the Wankel over the years. One thing that’s worth mentioning that I didn’t exactly spell out is that NSU’s license agreements gave NSU access to its licensees’ rotary development information. NSU didn’t always implement the ideas that its licensees came up with (NSU and Toyo Kogyo went their own ways on a number of points), but Fröde et al were definitely fully aware of those developments. Our family had RO80s from about 1975 to 1980, when I was 9 to 14. The things I remember as outstanding were brakes, headlights, bootspace, interior space and silence, and that they are quite roly-poly, the amount of fuel used, and the cost of spares. This was a Brit car with the sealed beam halogen lights. No one wants them in less than pristine condition, so our 3 cars (1 had last run in 1980, the others were non runners for rebuild and parts bought back in 1980), so all 3 were cut up and scrapped last year when we moved to a smaller house. Very nice article and it is difficult to find well researched information about NSUs in general. 2) The Spider always had only a single spark plug in production. It did not use a coil, but had an early electronic ignition which utilized an electron tube to generate the necessary hot spark. Thanks for the corrections — I’ve amended the text. hey,i have read the comments on this site and find some quite interesting.the ro80 was and is a unique auto,i know i owned four or five and even drove one coast to coast;california to new jersey years ago. bought the first one from dec auto in boulder,co. and the last one was converted to a 12a mazda. still have a parts and repair manual in english along with usa headlite assembly and amber directional lens for usa. give me a call to chat about the car and experiences of owning and driving one. Thanks, Dan. I redacted your phone number so that random spammers don’t use it to bug you. I have been seeing an Ro80 on the road here in Barbados fairly frequently of late,and a couple of weeks ago I met the owner, whose name is John King, at a classic car show. He said an English expatriate imported the car around 2002 (and I do recall seeing it once or twice in the north of the island back then. The expat sold it to a local car collector, who drove it for about 75 miles before putting it in storage. John bought it in 2013 after seeing it at a classic car show and has been using it as his daily driver since then. This car is a 1974 model and uses the upgraded NSU engine. John says the engine works well and he has only changed the water pump on it. He noted that it was not the most fuel efficient car and required oil changes every 1000 miles or so, but he said the frequent oil changes were advantageous in that they ensured the engine was always properly lubricated and the oil was clean. Cosmetically, it was resprayed in the original light blue, and the cloth inserts in the upholstery were changed, but everything else was original and all the accessories, including the electric sunroof, were in good working order. John added that cricket legend and Barbadian National Hero, Sir Garfield Sobers, brought the first Ro80 into Barbados in the early 1970s when he was at the height of his cricketing career. It was a 1972 model, whichi he kept for a couple of years. Eventually it passed through the hands of several owners until, to the best of his knowledge, it was scrapped some time in the late ’70s or early ’80s. Interesting! It’s always neat to see the unexpected places cars end up. Thanks for the info. Please send me photo of the Ro80 in Barbados for our archives. BTW-My grandfather 6 generations ago (1767-1790) had business dealings in Barbados….. he was the bookkeeper for a shipping firm…. their ship was named Barbados. Cannot help but wonder whether all that investment towards the Rotary by NSU would have been better spent on developing say a Lancia-inspired 2.0 narrow-angle V4 Twin-Cam engine for the NSU Ro80. Or buying engines from Lancia, which could have used the income! The difficulty, of course, is that controlling the rights to the Wankel engine was also a big part of the reason NSU had the money to develop the Ro80; rotary engine royalties were a major source of income for what was after all a very small company. A V-4 would still have cost them a lot to develop and wouldn’t have offered the same income potential. Apparently SAAB was a more likely candidate for the Lancia V4 engines until they went for the same unrefined / underpowered Ford V4 in the NSU Ro80 conversions for the SAAB 96, a pity really that the 96 never utilized the Fulvia V4. Also the Fulvia V4 was said to be at the limit capacity wise though a shelved 1600cc Fulvia V4 project with variable valve timing for rallying was looked into prior to the Lancia Stratos project. How many cylinders would an Otto-cycle engine need to have in order to have the same number of power strokes per revolution as a two-rotor Wankel? Four cylinders – one bang every 180 degrees of the flywheel. From asking around the Ro80 Clubs, it seems that some within NSU did indeed investigate the use of a conventional Flat-6 engine for the Ro80 until it was stopped by NSU officials who found it undesirable. Unfortunately no further details of the Flat-6 prototype engine are available. Though the following is baseless speculation is on my part, it makes one wonder whether closer cooperation between NSU and Citroen beyond the Comotor join-venture or an alternate non-Comotor arrangement was considered. Particularly if such cooperation between NSU and Citroen potentially connects back to the NSU Flat-6 prototype engine in the event the Flat-6 is somehow revealed to NOT be a unique in-house NSU design, but rather in essence a (possibly water-cooled) Flat-6 version of what became the air-cooled Citroen GS Flat-4 (via the earlier Citroen C-60 and F projects) or air-cooled 2-litre Panhard X4 prototype Flat-4 (later used on the Panhard AML) engines. Worth mentioning as well as that the water-cooled Volkswagen / NSU K70 engine was essentially a development of the air-cooled Inline-4 engine mounted in the rear of the NSU 1200, so it might be the case that water-cooling was considered for the NSU Flat-6 engine regardless of its true origin. Hard to say. One point worth considering is that, as Chevrolet found with the Corvair, air-cooled flat-fours and flat-sixes are to some extent different animals — at least in automotive applications, the cooling requirements are quite a bit different. With water-cooled engines, I imagine that developing a six from a four or vice versa would be somewhat easier. 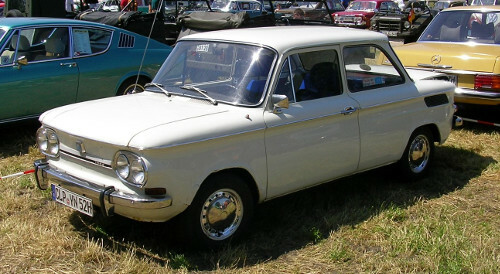 The upshot, I think, is that for NSU to develop a workable flat-six — assuming they did not have a production partner from which they could purchase or license an existing design — would have been a substantial additional investment in engineering and production resources, which wouldn’t necessarily have been any less risky than the Wankel. So, I can see why the NSU directors would be reluctant to go that way. Considering what happened to both NSU and Citroen, one cannot help but wonder whether they would have fared better had they not been fully committed to the Wankel Comotor joint-venture, but rather focused on more conventional engines. NSU had the 1.6-1.8 K70 engine that may or may not have been capable of being enlarged further to a 2-litre as well as the Flat-6 prototype engine. There was also the NSU K50 project aka Audi 50 / VW Polo that may have either used what became the VW EA111 engine from the outset or water-cooled developments of the air-cooled NSU Prinz/1200/etc engines, the latter assumes NSU remains independent from VW. Citroen meanwhile could have further enlarged its Flat-4 engine beyond 1299cc to around 1600cc or beyond, perhaps even find a use for the 2-litre Panhard Flat-4. Though there is also the fact that Citroen around that time owned Maserati as well. For Citroën, there’s a strong argument that they should have put more into modern four-cylinder engines, which ended up being a weak point in a couple of different areas. The 1.3-liter flat-four’s expansion potential is uncertain. People have taken them out to 1.6 liters, but as Julian Marsh’s excellent Citroënet site notes, Citroën was very wary of doing so for cooling reasons, which is fair. I don’t know that the Panhard engine was a reasonable modern alternative, but the reciprocating-engine GS could certainly have benefited from a bigger option, no argument there. As for NSU, they were dealing with the facts that (a) they were running out of money and (b) the Wankel was, while not quite their ONLY asset, the only one that was headline-worthy. They were a tiny company with something that, at least for a while, everybody was interested in. A me-too response to that class would have been technologically safer, but also sounds like a recipe for commercial oblivion. Agreed that Citroen should have developed modern water-cooled 4-cylinder engines, though they did look a transverse-mounted 1.6-litre water-cooled engine derived from the DS engine for Project F.
Interested in reading up the Citroenet link on the uncertainty of further expanding the Flat-4 engine beyond 1.3-litres. Since the Citroen C-60 project did look at a 1.4-litre Flat-4 and assuming any relation exists between the Flat-4 and 2CV Flat-Twin engines, the Citroen Project F was to feature a 750cc Flat-Twin derived from the 2CV engine that doubled up as a Flat-4 creates a 1.5-litre Flat-4 (with some people even enlarging the 650cc 2CV Flat-Twin to as much as 800cc). Guess NSU had to take a risk with the Wankel if it was indeed in a dire position though was under the impression they did rather well in cars and motorcycles. Curious to know whether NSU did consider producing 4-door versions of their rear-engined NSU Prinz 1000 / NSU 1200 models. Regarding risk, the dilemma for small companies not exactly rolling in capital (or individuals in the same position) is that if you aren’t doing at least relatively well, you aren’t in a position to do anything financially risky. If you can’t pay your rent, you aren’t going to buy stock and you probably aren’t going to start a new business venture. Examining the history of the auto industry, innovation very often comes from companies that have had some success — enough to give them some money to play with — and that are looking to grow and bolster their position; that’s generally the most exciting and interesting phase of a company’s development. Established segment leaders don’t have much incentive to take risks and players who are struggling can’t afford to. Regarding the NSU Spider (and even the NSU Sport-Prinz), were non-Wankel versions considered such as regular and TT/TTS spec 996-1177cc NSU air-cooled OHC engines? Not so far as I know. That might have been a logical development if NSU had considered the Sport-Prinz or the Spider a commercial priority, which I’m not sure they did. I don’t know that the Sport-Prinz was ever a big seller, and the Spider was pretty clearly a short-term expedient: “How can we create a ‘new’ model to showcase our first production rotary engine without investing a lot of money in anything other than the engine, which we’re still trying to make work?” The fact that the Spider and Sport-Prinz were dropped about the time the Ro80 debuted is probably indicative in this regard. It’s possible (speaking strictly speculatively now) that NSU might eventually have developed replacements, offering both piston and rotary engines, but NSU just didn’t have a lot of money and the Ro80 and K70 were their principal priorities at that time. Interestingly it seems Citroen themselves also looked at air-cooled Flat-6 and water-cooled Flat-4 engines for the Citroen CX (as opposed to the earlier Flat-6 attempt with the Citroen DS), which goes back to the idea that both Citroen and NSU should have collaborated on Flat engines instead of going bankrupt trying to develop the Rotary engine. Info elsewhere suggests a Citroen CX prototype featured a water-cooled 95 hp 1654cc Flat-4 engine that may or may not be connected to collaboration between Citroen and Fiat owned Lancia whose Flat-4 engines were later used in the Lancia Gamma. NSU assuredly did not go bankrupt developing the rotary engine, royalties on which were one of their major sources of income throughout the sixties, through the point VAG acquired them. (Neither did Citroën, for that matter, although the failure of the Comotor joint venture and the GS Birotor certainly didn’t do them any favors.) The Ro80 would have been been a financial strain for NSU even if it had had a conventional engine, and if the engine had been newly developed, expensive teething problems would not have been unlikely, with similar results.